Each year the Motorcycle Sportsmen hold Club Championship known as the Southern Downs Road Race Series. This is a well contested series providing classes for all types of machines and riders. 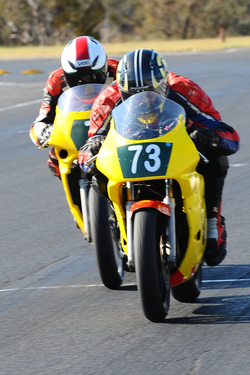 Events on the Motorcycle Sportsmen of Queensland’s racing calendar include race classes to cater for most types of motorcycles and sidecars in the club’s racing calendar. Typically, multiple classes are grouped into Formulas which make up the individual grids at club racing events. Motorcycle Sportsmen of Queensland are a Motorcycling Australia (MA) affiliated club and all club events are conducted under MA permits. As described below, many of the rules associated with the race classes provided by the club are as per the MA Manual of Motorcycle Sport (MoMS) which is available from the MOMS website. There are some classes which are not included in the MoMS but are supported by the club. For these classes, links to (brief) rules have been included below. ​List of 2019 Classes and capacity rules as per above concept, each class will have a set of trophies. Classes may be combined on a grid. Changes to 2018 rules in red. Riders may choose to enter clubman but discretion lies with clark of course if they deem you should be moved up to the formula 1 class. If you hold a graded licence A or B you may not enter clubman. Recognised club subclass, with series points. There will be no Queensland Road Race Championship for the Formula 1 Clubman class. Riders may choose to enter clubman but discretion lies with clark of course if they deem you should be moved up to the formula 2 class. If you hold a graded licence A or B you may not enter clubman. There will be no Queensland Road Race Championship for the Formula 2 Clubman class. As per Production, however aimed at riders with a focus on the fun and camaraderie of racing. Recognised club class, with series points. There will be no Queensland Road Race Championship for the Production Clubman class. Cross entries from Production to this class are not allowed. 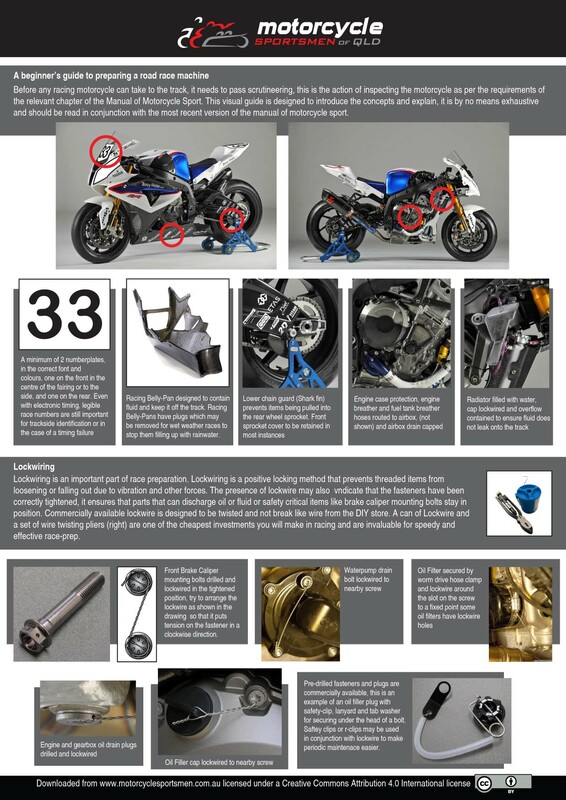 Check out our visual guide for the person who wants to race-prep their bike. Use this as a companion to the requirements set out in the Road Race chapter of the General Competition Rules available at www.moms.org.au. Click on the image for a printable PDF copy. publication dates are not proof of eligibility. the original component being replicated. e) Forks and fork yokes. shall be eligible for that period. known and used in the period.